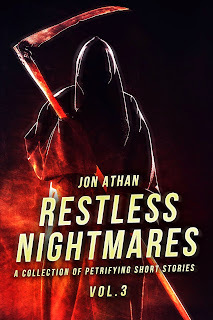 Jon Athan: Restless Nightmares Vol. 3 is available now! If you didn't read the title, Restless Nightmares Vol. 3: A Collection of Petrifying Short Stories is available today! With your purchase, you get ten stories of demons, ghosts, mutants creatures, true-to-life horrors, and much more — a balanced blend of traditional and experimental horror. You can purchase it for $2.99 or borrow it using Amazon's Kindle Unlimited and Kindle Lending Library programs. Regardless, thank you for the support! This book, like my others, was fueled by my passion for horror and storytelling. Without you, I wouldn't be able to keep writing (at least as frequently as I do now.) So, once again, thank you!